Zion Market Research has published a new report titled “Smart Transportation Market By Technology (IoT, Wireless Technology, GPS, and Sensing Technology), By Solutions (Parking Management Systems, Traffic Management Systems, Ticketing Management Systems, and Integrated Supervisory Systems), and By Services (Cloud services, Professional Services, and Business Services): Global Industry Perspective, Comprehensive Analysis And Forecast, 2017 – 2024”. According to the report, global smart transportation market was valued at approximately USD 58.28 billion in 2017 and is expected to reach approximately USD 236.06 billion by 2024, growing with a CAGR of around 22.12% between 2018 and 2024. In smart transportation, information & communication technologies are applied to the road transport field that includes, traffic management, mobility management infrastructure, vehicles, and other modes of transport. Smart transportation includes numerous technologies such as signal control system, vehicle navigation, container management system, automatic vehicle number plate recognition system, and more. In addition, speed cameras include security CCTV system and other applications that integrate real-time data and feedback from other resources. Smart transportation market is mainly driven by rising demand of passenger safety and concerns regarding environmental protection. Another key driver is government initiatives for smart cities due to the rising number of accidents and poor traffic management. However, high initial investment is hindering the growth of smart transportation market. Emerging technologies such as GPS, Internet of Thing (IoT) reduces the travel time, improves the safety of passengers; these factors are anticipated to fuel the demand of the smart transportation market. IoT is seen as the most advanced solution for next-generation transport networks by which transportation systems will be cost-effective, cleaner, and energy efficient. The segmentation of smart transportation market is done on the basis of technology, solutions, services, and region. By technology, the market is divided into IoT, wireless technology, sensing technology, and GPS. In solutions segment, smart transportation market includes parking management systems, traffic management systems, ticketing management systems, and integrated supervisory systems. Parking management system guides in finding a number of empty slots available at parking and real-time vehicle counting. Traffic management systems are used to manage the flow of vehicle and improved safety. Services segment is fragmented into cloud services, professional services, and business services. Geographically, the market is divided into North America, Europe, Asia Pacific, Latin America, and the Middle East & Africa. Europe is anticipated to dominate the smart transportation market and it accounted for the largest share in 2017. The major growth factor includes government initiatives and rising roadways network. North America and the Asia Pacific are expected to present significant growth due to the adoption of several new technologies and road safety concerns. Rising demand in developing economies such as China and India is anticipated to open new avenues for the Asia Pacific smart transportation market. 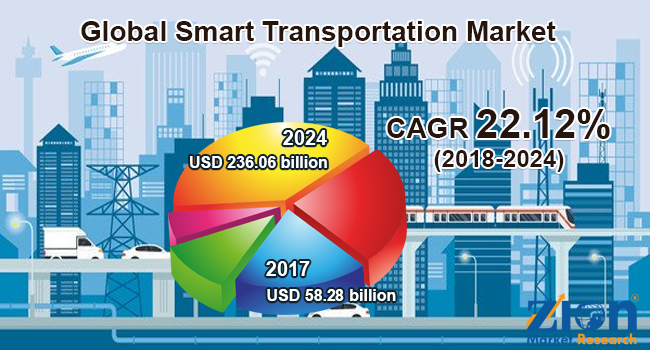 The key players operating in smart transportation market are Cisco Systems, Alstom AG, Thales Group, Kapsch TrafficCom AG, Siemens AG, LG CNS Co. Ltd., Cubic Corporations, GE Transportation, IBM, Indra Sistemas S.A., WS Atkins, and Accenture Plc., among others.